Blue on blue fleece lined coat. Lands' End builds their children’s Squall® Parka just like they do for adults with premium, bulk-free insulation and weather-proofing to keep the wind and water out, but they also add tons of kid-friendly features like Grow-a-Long™ sleeves & SnowGuard sleeve cuffs. That’s why Lands' End builds their children’s Squall® Jackets & Parkas just like they do for adults with premium, bulk-free insulation and an ultra-durable, waterproof nylon shell. But they also add tons of kid-friendly features like Grow-a-Long™ sleeves, SnowGuard™ sleeve cuffs and EZ-Zip tabs for mitten-clad hands. Our best value in fully-featured outerwear! Squall collection gives kids superior wind- & water-proof warmth at a great price. This system piece is an even greater value, because you get three coats in one: an insulated shell & midweight fleece jacket/liner that zip together for colder weather. Lands End Kids. Full-Zip Rain Jacket with Hood, Vents, Pockets. I do my very best to be accurate, but I am human and I do make mistakes on occasion. Every effort has been made to remove pet hair but an occasional rogue hair could turn up on your item! PREOWNED LANDS END PINK JACKET COAT. NYLON SHELL AND LINER. GOOD CONDITION MISSING ITS ZIP OUT LINER. SIZE XL 16 YOUTH. 27 DOWN THE BACK. Ready for any forecast! Elastic hood for stay-put coverage. Long sleeves with elastic cuffs. Curved hem. Color: Bright Pink Multi Dots. 100% Nylon. Chest: 38" Waist: 36" Hem: 38" Shoulder to Hem: 25"-26". Polartec Aircore - 300. Lands End Classic Squall Jacket. purple grape color solid. 100% Polyester Fleece. Girls: Large 14 - 16. attached hood. Lands' End. Material : 100% Nylon shell ~ 100% Polyester lining. Color : Eggshell White. There will be. FREE Trial! Review details and pictures carefully. Lands' End. Material : 100% Nylon shell ~ 100% Polyester lining. There will be. FREE Trial! Review details and pictures carefully. Green windbreaker jacket from Lands' End. --Good pre-owned condition with light wear throughout. --100% Nylon outer, 100% Cotton body lining, 100% Polyester sleeve lining. 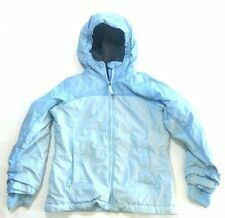 Fleece Lined Parka Jacket Coat Hood Ski Snow Blue. Girls Size Large 14. shoulder to hem 26". armpit to armpit 19". Lands End little girls size small 4. in very good condition. 23" length. 100% nylon'insulated with polyester. Ski Snow Pants Girls Pink Kids Winter Snowboard Zip Pockets. Gently used condition. inseam 17". Parka length hits below the hip. Toasty 300-weight fleece lining in the body and hood. Center-back elastic Waterproof, windproof, 3-ply nylon shell. Shell: 100% nylon; Lining: 100% polyester. Machine wash.
Land's End Kids Lightweight Rain Jacket Windbreaker with Hood and Pockets, Green. Lightweight nylon Land's End kids rain coat. 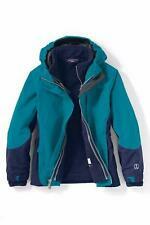 Lands' End Squal Parka Fleece Lined Hoodie Jacket. Color: Ivory. Attached fleece-lined hood with bill on top, elastic at sides for it. Machine wash and tumble dry low. Lining: 100% polyester. Five front pockets two with zipper closure, three with velcro. Girls 5/6 Lands End Kids Purple Lightweight Jacket Rain Wind Spring. Condition is Pre-owned. Shipped with USPS Priority Mail. Zips in the front two front pockets 1 back zip pockets. I also have this in size 7-8 in another auction. EXACT ITEM IS PICTURED ABOVE. EXCELLENT CONDITION! This is a NICE, "Lands' End" light blue hooded coat! There is 1 inside pocket as well, it also has a zipper. All zippers work great! The inside lining is fleece, very warm! If you've been searching for a GREAT deal on a TOP QUALITY children's hooded coat.THIS IS IT! From ski slopes to sledding hills, we think our snow bibs & pants are the best fully-featured value out there. Waterproof & windproof they are also built with Iron Knee® & Seat. What's that?. •Waterproof and windproof nylon shell. EUC Lands End Girl’s Stormer Grow Along Pink Jacket Zip Out Fleece Liner With hood. Sz 7/8. Zip front closure with 3 zip up front pockets. Hook and loop sleeve closures and hood adjustment. See pics. Shipped with USPS Priority Mail.